Beowulf (c. 700 C.E.) is a heroic epic poem, written in Old English, and easily the most important work of literature written in that language. At over 3,000 lines, the poem makes up 10 percent of the entire corpus of extant Old English literature. Beowulf is also one of the earliest surviving documents written in any vernacular language—one of the most valuable glimpses into the culture and history of the medieval ages afforded to historians. Although neglected for centuries, Beowulf, with the aid of a number of compelling modern translations, has entered into its own as one of the most popular and enduring epic poems ever written. Since the nineteenth century, the poem has continued to receive praise as a great work of literature comparable to the classical epics of Homer and Virgil. With its distinct style, written in booming Anglo-Saxon meter, and telling a tale with the spareness and forthrightness one would expect of medieval warriors, Beowulf is a moving depiction of heroism and virtue in a medieval age plagued by violence and rivalry. Beowulf presents a rare, primary-source view of medieval society, culture, and literature. It displays concern with honor and vassalage, as well as with lineage, which has largely disappeared as a sustaining social construct from Western society since the Enlightenment. Family loyalty was the predominant feature of the culture depicted in the epic poem, but that loyalty cuts two ways. Honor means concern for lineage, but it also easily spirals into a cycle of violence and, particularly, the need for revenge. Beowulf has exerted its influence on a number of modern poets and fiction-writers. Gerard Manley Hopkins adapted his "sprung rhythm" from the harsh rhythms of Beowulf; Ezra Pound was influenced deeply by the poem, and attempted a translation along with several other Anglo-Saxon poems; and, perhaps most notably, J.R.R. Tolkein was deeply influenced by the poem, drawing much of the material for his fantasy world from the world of Beowulf, where magic was still potent and heroes commanded loyalty through the force of character. Beowulf is one of the oldest surviving epic poems in what is identifiable as an early form of the English language. In the poem, Beowulf, a hero of the Germanic tribe of Geatland, from southern Sweden, travels to Denmark to help defeat a monster named Grendel. This poem, about Danish and Swedish kings and heroes, was preserved in England because the English people are descendants of Germanic tribes: the Angles, Saxons, and Jutes. Jutes and northern Saxon tribes came from what is now southern Denmark and northern Germany. Beowulf tells a story about the old days of the Anglo-Saxon people in their native land. At the proposed time of the poem's composition (roughly 700 C.E.) the Anglo-Saxons had only migrated to England a few hundred years before; the connection between the Anglo-Saxons, the Danes, and the Geats was still quite strong, and the poem is in some sense an attempt to reconcile the cultures of these different Germanic peoples. The poem is a work of fiction, but it mentions an historic event, the raid by King Hygelac into Frisia, ca 516. Several of the personalities of Beowulf (e.g., Hrothgar, Hrothulf, and Ohthere) and some of the events also appear in early Scandinavian sources, such as the Prose Edda, Gesta Danorum, and the fornaldarsagas, among others. These sources, especially the Hrólf Kraki tales, refer to the same set of characters in Denmark and Sweden. Consequently, some scholars believe that many of the people and events depicted in the epic were probably real, dating from between 450 and 600 in Denmark and southern Sweden (Geats and Swedes). In Sweden, this dating has been confirmed by archaeological excavations of the barrows indicated by Snorri Sturluson and also by Swedish oral tradition as the graves of Eadgils and Ohthere, minor characters who figure in the poem. Like several other shorter surviving poems, Beowulf has consequently been used as a source of information about Scandinavian and Germanic history. The traditions behind the poem probably arrived in England at a time when the Anglo-Saxons were still in close dynastic and personal contacts with their Germanic kinsmen in Scandinavia and northern Germany. While it could be said that Beowulf is the only substantial extant Old English poem that addresses pagan rather than Christian matters, there are nonetheless Christian viewpoints expressed within the poem, although the overall judgment on both Christian and heroic society is ambiguous. A turning point in Beowulf scholarship came in 1936 with J.R.R. Tolkien's article Beowulf: The Monsters and The Critics when, for the first time, the poem was seriously examined for its literary merits, and not just scholarship about the origins of the English language, as was popular in the nineteenth century. Perhaps no other single academic article has been so instrumental in converting a medieval piece of literature from obscurity to prominence, and now Beowulf is acknowledged as one of the finest pieces of Old English literature—and medieval literature in general. The precise date of the manuscript is debated, but most estimates place it close to the year 1000. Traditionally the poem's date of composition has been estimated, on linguistic and other grounds, as approximately 650–800. More recently, doubt has been raised about the linguistic criteria for dating, with some scholars suggesting a date as late as the eleventh century, near the time of the manuscript's copying. The poem appears in what is today called the Beowulf manuscript or Nowell Codex (British Library MS Cotton Vitellius A.xv), along with other works. The manuscript is the product of two different scribes, the second and more accurate scribe taking over at line 1939 of Beowulf. The poem is known only from a single manuscript. The spellings in the surviving copy of the poem mix the West Saxon and Anglian dialects of Old English, though they are predominantly West Saxon, as are other Old English poems copied at the time. The earliest known owner is the sixteenth century scholar Laurence Nowell, after whom the manuscript is known, though its official designation is Cotton Vitellius A.XV due to its inclusion in the catalog of Robert Bruce Cotton's holdings in the middle of the seventeenth century. It suffered irreparable damage in the Cotton Library fire at the ominously-named Ashburnham House in 1731. Icelandic scholar Grímur Jónsson Thorkelin made the first transcription of the manuscript in 1786 and published it in 1815, working under a historical research commission of the Danish government. 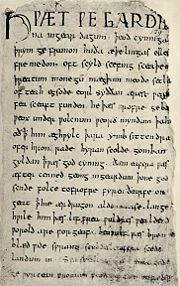 Since that time, the manuscript has suffered additional decay, and the Thorkelin transcripts remain a prized secondary source for Beowulf scholars. Their accuracy has been called into question, however (e.g., by Chauncey Brewster Tinker in The Translations of Beowulf, a comprehensive survey of nineteenth century translations and editions of Beowulf), and the extent to which the manuscript was actually more readable in Thorkelin's time is unclear. The poem as it is now known is a retelling of folktales from the pagan, Anglo-Saxon Oral tradition directed at a Christian audience. It is often assumed that the work was written by a Christian monk, on the grounds that they were the only members of Anglo-Saxon society with access to writing materials. In historical terms the poem's characters would have been pagans. The poem's narrator, however, places events into a Biblical context, casting Grendel and Grendel's Mother as the kin of Cain and placing monotheistic sentiments into the mouths of his characters. Although there are no direct references to Jesus in the text of the work, the Old Testament serves as an important touchstone, and poem's tone and style are indeed quite similar to the straightforwardness and violent nature of many Old Testament stories. Scholars disagree as to whether Beowulf is a pagan or Christian poem in nature. The poem most certainly valorizes a pagan people and their ruthless, un-Christian customs of vengeance and warfare. It is often suggested that, since the poem was almost certainly transcribed by a Christian monk, the poem's scribe attempted to adapt a pagan poem to Christian viewpoints by making minor changes to the text. Beowulf depicts a Germanic warrior society, where relationship between the king and his thanes, or warriors is of paramount importance. In Beowulf, this relationship was defined in terms of provision and service; the thanes defend the interest of their king in return for material provisions: Weapons, armor, gold, silver, and supplies. Beowulf begins with the story of King Hroðgar (also written Hrothgar), a great king of the Danes, who has built the great hall of Heorot to house and protect his people. Safe in the walls of Heorot, Hrothgar, his wife Wealhþeow, and his warriors spend their time singing and celebrating until Grendel, a hideous monster, attacks the hall and kills and devours many of Hrothgar's warriors. Hrothgar and his people, helpless against Grendel's attacks, abandon Heorot in shame. Beowulf, a young warrior from Geatland, a region of southern Sweden, hears of Hrothgar's troubles. Beowulf recalls Hrothgar's kindness to his father, Ecgtheow, many years before; he gathers a band of warriors and, with his own king's permission, leaves for Denmark to aid Hrothgar in his time of need. He receives a warm reception at Heorot, including a feast, music, and banter. Many of the Danes, although impressed by Beowulf's strength and stature, insist that Grendel is invincible, and that he and his men could not possibly do any better than the Danes themselves against the beast. Beowulf ignores these comments, and his men spend the night in Heorot while Hrothgar and his people leave, knowing that the monster will return at nightfall. After Beowulf's men fall asleep, Grendel enters and attacks, devouring one of Beowulf's men. Beowulf, feigning sleep, leaps up and grabs Grendel's arm in a wrestling hold, and the two battle until it seems as though the hall itself might fall down from the force of their battle. Beowulf's men draw their swords and rush to his help, but Grendel is a magical creature and cannot be harmed by mere swords; only Beowulf's pure strength can possibly defeat him. Finally, Beowulf tears Grendel's arm from his body and Grendel flees home, bleeding to death. The next night, after celebrating Grendel's death and lauding Beowulf with gifts and praise, Hrothgar and his men sleep in Heorot for the first time since Grendel's appearance. Grendel's mother appears and attacks the hall. She kills Hrothgar's most trusted warrior in revenge for Grendel's death and promises to menace Heorot just as her son once did. Hrothgar, Beowulf, and their men track Grendel's mother to her lair under an eerie lake. Beowulf prepares himself for battle; he is presented with a sword, Hrunting, by a warrior called Unferth, one of the Danes who had most vocally doubted Beowulf's prowess. After stipulating to Hrothgar what should be done in the event of his death, Beowulf then dives into the lake to do battle with Grendel's mother. There, he is swiftly detected and attacked by the monster. Unable to harm Beowulf through his armor, Grendel's mother drags him to the bottom of the lake. There, in a cavern containing her son's body and the remains of many men that the two have killed, Grendel's mother and Beowulf wage a ferocious battle. Grendel's mother at first gains the upper hand. Hrunting, the sword given to Beowulf by Unferth, proves to be useless against the creature. Grendel's mother moves in for the kill, but again Beowulf is saved by his mighty armor. Beowulf spies a mighty sword lying in a heap in the monster's lair (a sword so heavy, the poem tells us, no other warrior could have lifted it) and, grasping it quickly, Beowulf beheads Grendel's mother. Traveling further into the lair, Beowulf discovers Grendel's corpse; he severs the head, and with the heads of the two creatures he returns to Heorot (the warriors who had been waiting at the surface of the lake having given up, presuming that Beowulf had been killed). He is given many gifts by an even more grateful Hrothgar, and at last peace returns to Denmark and Heorot. die than live a life of shame. hu ða æþelingas ellen fremedon." how the noble ones did deeds of valor." Old English poetry does not have meter in the traditional sense. Most other poetry, including the poetry of the medieval ages as well as most of the classical Latin and Greek poems, follow strict forms where the number of accented and unaccented syllables is always the same. In Anglo-Saxon poetry, however, the syllables are not counted at all; some of the lines in Beowulf run quite long while others are short. The meter of the poem is defined by its accented syllables only: Each line contains four accented syllables, three of which alliterate and one of which does not. In addition to this, each line includes a pause, called a caesura (the term is Latin, not Germanic); although other forms of poetry, particularly Latin, also include such a pause, the caesura in Beowulf and in Anglo-Saxon poetry in general is irregular; it does not always fall at the middle of the line. All these technical aspects make Beowulf and other Anglo-Saxon poetry rather difficult to translate, with some authors taking more liberties than others with the form. The rhythm of Anglo-Saxon poetry, when read aloud properly, is altogether different from the more regular rhythms of most other poetry. Due to the focus on alliteration rather than rhyme and the rather harsh consonants of Old English in general, Beowulf reads quite forcefully in the original, sounding almost more like a battle-chant than a poem. This, of course, is consistent with the rather war-like tone of the poem, and of the culture of the Anglo-Saxons in general. Beowulf also makes liberal use of kennings, an Old English technique of metaphor, where simple things are referred to by complicated names. For example, a poet might call the sea the "whale-road"; a king might be called a "ring-giver"; and a battle might be a "blade-dance." There are many kennings in Beowulf, and the device is typical of most poetry in Old English,. The name Beowulf itself may be a kenning for "bee-hunter," that is, for "bear." Scholars suspect that kennings relate very closely to the oral nature of Old English poetry; a poet could use kennings of common words so as to complete the meaning of a given line while still preserving the alliterative meter. The style is quite similar to other ancient poetry, most notably Homer, whose Homeric formulas (repeated words and phrases used to describe certain characters and objects that vary based on the length of the line) are remarkably similar to Old English kennings. ac for higeþrymmum Hroðgar sohton." But for greatness of heart, you have sought Hrothgar." beodgeneatas; Beowulf is min nama. Table-companions. Beowulf is my name. þæt we hine swa godne gretan moton." that we might be allowed to address him, he who is so good." ðe me se goda agifan þenceð." That the great one sees fit to give me." The first translation, by Grímur Jónsson Thorkelin, was done in Latin, in connection with the first publication of his transcription. Nikolaj Frederik Severin Grundtvig, greatly unsatisfied with this translation, made the first translation into a modern language—Danish—which was published in 1820. After Grundtvig's travels to England came the first English translation, by J. M. Kemble in 1837. Since then there have been numerous translations of the poem in English. Irish poet Seamus Heaney and E. Talbot Donaldson have both published translations with W.W. Norton of New York. Other popular translations of the poem include those by Howell D. Chickering and Frederick Rebsamen. Among the most widely used translations—sometimes in conjunction with one another—are E.T. Donaldson's very literal prose version, and Burton Raffel's verse rendering. Grendel: The Beowulf story is retold from Grendel's point of view in this (1971) novel by John Gardner. Beowulf exercised an important influence on J.R.R. Tolkien, who wrote the landmark essay Beowulf: the Monsters and the Critics while a professor of Anglo-Saxon at Oxford University. Tolkien also made a translation of the poem, which the Tolkien Society has recently decided to publish. Significantly, the word orc-neas is used to describe Grendel's race. Many parallels can also be drawn between Beowulf and Tolkien's The Hobbit. ↑ University of Virginia Library, Genesis, from The Holy Bible, King James version. Retrieved June 28, 2007. Alexander, Michael. Beowulf: A Glossed Text. Second ed. London: Penguin, 2000. Jack, George. Beowulf: A Student Edition. New York: Oxford University Press, 1997. Klaeber, Fr, ed. Beowulf and the Fight at Finnsburg. Third ed. Boston: Heath, 1950. Mitchell, Bruce and Fred Robinson, eds. Beowulf: An Edition with Relevant Shorter Texts. Oxford: Malden Ma., 1998. Crossley-Holland, Kevin and Bruce Mitchell. Beowulf: A New Translation. London: Macmillan, 1968. Heaney, Seamus. Beowulf: A New Verse Translation. New York: W.W. Norton, 2001. —"Introduction" in Crossley-Holland, Kevin (tr.) Beowulf. London: Folio, 1973. Morgan, Edwin. Beowulf. Manchester: Carcanet, 2002 (first published 1952). Swanton, Michael (ed.). Beowulf. Manchester: University, 1997. Tinker, Chauncey Brewster. The Translations of Beowulf; A Critical bibliography. New York: Holt, 1903. (Modern reprint with new introduction, Hamden: Archon Books, 1974). Old English edition edited by James Albert Harrison and Robert Sharp. Modern English translation by Francis Barton Gummere. Modern English translation by John Lesslie Hall. James Grout: Beowulf, part of the Encyclopædia Romana. Scyld Shef'sson and the epic poem, Beowulf. This page was last modified on 2 June 2016, at 16:11.